In this edition John answers questions on the oldest surviving Tri-Nations internationals, the first players to achieve 50 Test wins, Nick Baxter's Barbarians appearances, Ireland's George Bradshaw and Test twins. Piet Malan is the senior surviving Springbok and until his passing in his 100th year earlier this month, Eric Tindill was the senior All Black. The senior surviving New Zealand Test player is now the 1946-1949 All Black, Morrie McHugh, who is nearly three years older than Fred Allen (the next senior New Zealand Test player). McHugh and Allen made their Test debuts together against Australia in 1946 in the first Test played by New Zealand after the Second World War. Boyd Oxlade made his Wallaby Test debut in the back-row against the 1938 All Blacks at Sydney, but another Aussie rookie that day was scrum-half Charles Gordon Stone, winning his only Test cap. Born 6 April, 1914 and a month older than Oxlade, Stone is the oldest surviving Wallaby Test player. Serge Blanco became the first player to record 50 Test wins, achieving the feat by playing against the United States in Colorado in July 1991. 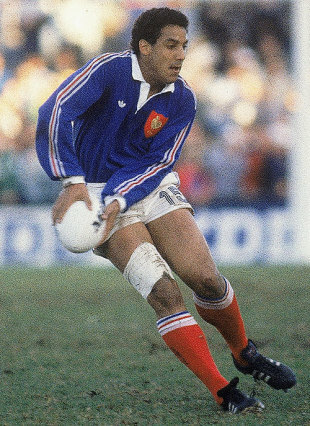 He then played on the winning side against Wales in a floodlit game in Cardiff in September 1991 and in three winning pool games for France at the 1991 RWC itself before retiring on a losing note to England in the quarter-finals. Philippe Sella played his 50th Test win for France in their final 1991 RWC pool match against Canada and Gary Whetton became the third man to reached 50 Test wins when he captained New Zealand to victory in the third/fourth place play-off game with Scotland in Cardiff that year. How many games did Nick Baxter play for the Barbarians and between which years? Nick Baxter made his debut for the Barbarians against Coventry in the Midlands club's 125th anniversary match at Coundon Road in 2000. The Longbridge-born wing played three games for the famous club in 2004 and two more in 2005, so six appearances in all. His final appearance was in the autumn of 2005 against the Combined Services. All told he scored 45 points (nine tries) for the Baa-Baas, contributing a try hat-trick to the Barbarians' 104-3 demolition of the East Midlands in the 2004 Mobbs memorial match at Franklins Gardens. Baxter's other honours included appearances for England Students and the England Sevens squad, representing his country at Kuala Lumpur in the 1998 Commonwealth Games. He began his club rugby with King's Norton, graduating to National League rugby with Worcester Warriors and Pertemps Bees. In 2006 he became the first player to reach 150 tries in National League rugby, but withdrew from the professional limelight shortly afterwards to concentrate on his business as a wine merchant, returning to his junior rugby roots with King's Norton. Mike Gibson holds the record for being Ireland's oldest Test cap. He was 36 years and 195 days when he made the last of his then record 69 appearances for Ireland, against Australia in 1979. John Hayes will become Ireland's oldest cap if he plays again for his country. The player you refer to is George Lomas Birch Bradshaw who was born on January 3, 1882 in Belfast (not July 1864). George was educated at Methodist College Belfast (where his father was a French teacher) and played for Belfast Collegians, the club founded in 1890 for former pupils of the school. He was a regular member of the club's side between 1898 and 1904, before business took him to Scotland. He won his only cap for Ireland from the Collegians club, playing right-wing marking the great Teddy Morgan of Wales at Cardiff Arms Park in March 1903. Wales won 18-0 on a muddy pitch, scoring six unconverted tries with only 14 men on the field for most of the match after George Boots had withdrawn just before half-time with a broken collar-bone. Bradshaw was only the third player from the Collegians club to win Ireland rugby honours. The photograph of that 1903 Irish fifteen at Cardiff shows him as a young man of 21 sitting on the floor beside Alfred Tedford as part of a group that includes the famous Irish out-half, Louis Magee. A dual international, George Bradshaw also represented Ireland at lacrosse. He was reported missing from his Edinburgh home and presumed dead in 1917. He was 35. The first pair of twins to play for Australia were the flying Sydney-born wings Jim (12 Tests 1962-1965) and Stewart Boyce (13 Tests 1962-1967). They actually played together four times, including the Tests when Australia beat South Africa in a Test series for the first time in 1965. Glen and Mark Ella played together for Australia in the first Test against Scotland in 1982 and against Italy on the European tour of 1983, before the Fainga'as, the third pair of twins to represent the Wallabies, appeared together against South Africa at Brisbane in the recent Tri-Nations match. The last pair of twins to appear in Tests before the Fainga'as were Akona and Odwa Ndungane, the Springbok wings, though they have not yet appeared together in a South Africa Test side. Arguably the best-known twins to play Test rugby were the Whettons of New Zealand. Lock forward Gary played 58 Tests and flanker Alan 35. The brothers were together 34 times in Tests, including every match of New Zealand's victorious run through the inaugural Rugby World Cup in 1987. They were New Zealand's regular #5 and #6 between 1987 and the 1991 Rugby World Cup. Argentina have produced two pairs of twins who have featured together in Rugby World Cups. The wings Pedro and Juan Lanza were capped against Italy and New Zealand in 1987 while Manuel and Felipe Contepomi were among the midfield backs in both the 1999 and 2007 tournaments. Before the Home Unions were allowed to award caps for matches against Argentina, twins Daniel and Gonzalo Beccar Varela played four times together in the Pumas threequarter lines of 1976 and 1977, including the match at Cardiff when a Test-strength Wales XV overcame Argentina 20-19 thanks to a late forty-metre penalty kicked by Phil Bennett. Italy's Cuttitta twins were far from identical: the fleet-footed wing Marcello and the powerful prop Massimo were azzurri regulars in the 1990s and appeared together at both the 1991 and 1995 Rugby World Cups. Earlier twins who played for Italy were Adriano (1972-1979) and Paolo Fedrigo. Paolo's only cap came at prop in front of his second-row twin in Italy's 9-6 defeat by Portugal in 1973. Arguably the most unusual pair of twins to play Test rugby were the Calders of Scotland, who were both flankers. They never played together in a Test for Scotland yet each won a Grand Slam with his country. Jim's career spanned the years 1981 to 1985 and included the 1984 Grand Slam when his late line-out try sealed the title victory over France. Finlay won his first cap for Scotland in 1986 and was a regular back-row fixture in the side until he retired in 1991. He was an ever-present in the side that won the 1990 Grand Slam and led the 1991 Lions to Australia. Ross Cullen was propped by Jim Miller and Roy Prosser that day. Miller played six Tests for the Wallabies between 1962 and 1967 while Prosser made the position his own in a 25-Test Aussie career that ended in 1972. Miller's last Test was Prosser's first, the pair propping up Peter Johnson at Twickenham against England in 1967 when the Wallabies outclassed their hosts 23-11 in what was then England's biggest-ever margin of defeat in a Twickenham Test. The Oxford University tour game took place a couple of months earlier on the same tour and was the infamous occasion when Oxford's Ollie Waldron had to leave the field with a lacerated ear, the result of a front-row biting incident that led to the Wallaby management sending home Ross Cullen shortly afterwards. Oxford, for whom scrum-half Nigel Starmer-Smith had an outstanding match, led 9-0 at the break, but the Wallabies rallied in the second-half and eventually scraped home 11-9 through a Jim Lenehan dropped goal kicked from near the half-way line.